We see signs of expansion of all things 5D: Freedom, personal independence, spiritual mindedness, fairness, cooperation, feelings of self-, community-, and national-responsibility, global perspectives and responsibility, initiative, true knowledge, understanding, wisdom, intuition, invention, kindness, compassion, passion, delight, seeing beyond the 3D physical capability—working, communicating, healing in those frequencies. What are all of the above, but expansions of Consciousness. Storm fields relinquish, as dregs are removed. No more war, killing, competition, thievery, lies, drugs that make and keep people sick, harmful GMO phude, illness and involuntary “death”, nor any of the negative things that we no longer want in our world. Earth and our lives are more calm, as the dregs of the former “human nature” and its consequences are removed. “Human nature” is now Hue-man nature. Waters of emerging Higher Energies wash the planet, and hu-being consciousness. 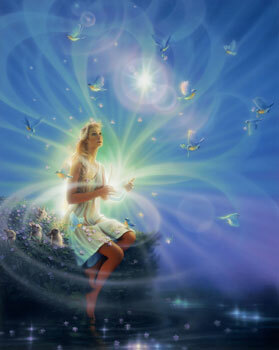 We of the First Wave of Ascension went through difficult times of physical and psychological adjustments to transformational energies while in the grosser energies of the period of transition from 3D to New Earth. Our energy blocks were knocked away rather roughly. The Higher Energies emerging hold more Light than could have been withstood back then. Ones who are still hu-beings experience finer, gentler transformational energies , like refreshing showers. Regular hu-beings are becoming shiny Hue-beings. The non-manifested non-being Absolute All, of potential manifestation, our ultimate Source, is the Nothingness. You may feel, as I do, that the Source is certainly not Nothing. It’s everything. The word translated as Nothingness was used by the ancients and may not be an exact translation. It appreciates in two ways: It becomes more, as we who are fractals of Source experience more; and It cherishes all new developments of galaxies, planets, and humans. After all, experience is the reason for our existence. It is the reason for Creation, itself.